The 49-year-old was in charge when Pompey ended a 14-month spell in administration in April and were taken over by the Pompey Supporters' Trust. "You always hope that you're going to get a bit of time to get things right. 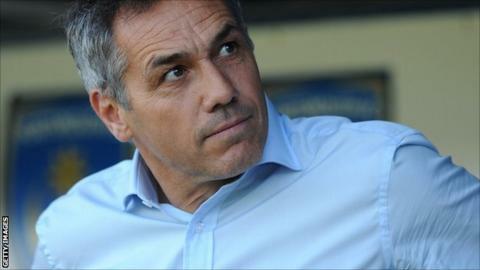 It was gutting, but you have to move on," Whittingham told BBC Radio Solent. The League Two club are set to appoint Richie Barker as his successor. The club have called a press conference for 14:00 GMT at Fratton Park to unveil their new management team. The ex-Bury boss, who was two days after Whittingham's departure from Portsmouth, is likely to be named as Pompey boss on Monday. He had in November 2012. A 12-month reign at Fratton Park, dominated by the club's severe financial problems, ended on 25 November with Portsmouth 18th in League Two. "There was shock and disappointment for sure," said Whittingham of his departure. "I was proud and privileged to be in that position and was determined to help the club come out of this difficult time. "Nobody will ever know what we went through, both on and off the pitch, during that administration period. It was a privilege to work with the players and have the support of the fans through that time. "That's the end of another chapter. I've got to get back into it [management] quickly because it's what I love doing. Hopefully that will come soon." And Whittingham has insisted that there is no bitterness towards the club about the manner of his dismissal, adding: "The people in charge do what they think is right for the football club. All the way along, I said I had the support of the board and I felt I did have that. "I don't regret my time at Portsmouth. As a player, as a coach and as a manager, I had huge support from the loyal fans that are down there and I really appreciated that."